The talks were underlined the importance of the Hungarian efforts to bring advanced technologies more closely to assist the implementation of UNESCO tasks via train the trainers. Her responsibilities include - among others - land protection, land valuation, land use, land-reorganisation, többek között a földvédelemmel, földminősítéssel, földhasználattal, re-cultivation, and many others tasks related to legislative measures and the preparation of decision making. 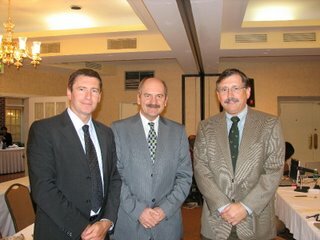 His important earlier responsibilities include the supervision of the activities of the National Cadastral Program Public Benefit Company, Presidentship of the intersectorial Map Availability Coordination Committee and representing MoARD in the Organising Committee of the National GIS Conference held annually in Szolnok For more details on the Terms of Reference of the mentioned departments please visit http://www.fvm.hu/ and click on Minisztérium and SZMSZ. The description can be found on the pages 60-63. Global Change, sustainable development and over-consumation. These topics will be addressed by the discussion forum arranged by the Hungarian Academy of Science, University of All Knowledge and supported by the Hungarian Telecom. As contribution a brand new NASA DVD was submitted to the organisers by HUNAGI to illustrate the impact of the global climatic change on the ice-covered areas of the Earth based on the visualisation of the systematic satellite monitoring of the changes. The DVD was introduced at the NASA workshop held in Annapolis on 13rd September. 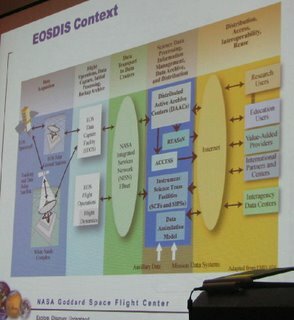 By request, it was offered for the today's event by Dr. Ken McDonald of NASA Goddard Space Flight Center. As far as temperatures drop in the Arctic winter – on average to -34°C (-29°F) – a new study shows that in the last two years sea ice is shrinking on the surface of Arctic waters to record low levels. 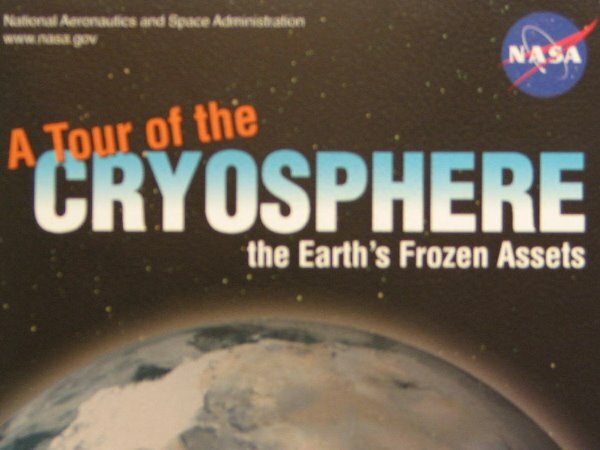 Using satellite data, scientists have observed unusually warm wintertime temperatures in the region and a resulting decline in the length of the Arctic seasonal ice. The maximum amount of sea ice in the Arctic winter has fallen by six percent over each of the last two winters, as compared to a loss of merely 1.5 percent per decade on average annually since the earliest satellite monitoring in 1979. This is happening as summer sea ice continues its retreat at an average of ten percent per decade. Another relevant information is the agreed NASA GSFC-HUNAGI collaboration to establish the Hungarian language version of the Global Change Master Directory of NASA. HUNAGI member EOGEO Foundation will play important role in this challenging work, but any voluntary contribution from the 113 member institutions and organisations of HUNAGI is welcomed. 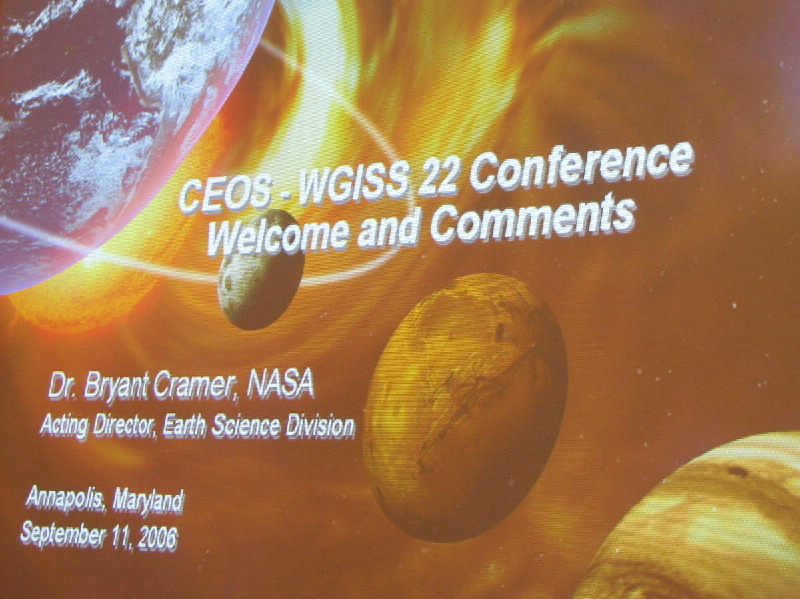 The WGISS-22 Meeting was enhanced with the NASA Workshop entitled: Guiding NASA's Earth Science Data Systems into the Future and followed by the WGISS Plenary. A full afternnoon session was devoted to discuss the potential WGISS contributions to selected GEO tasks. 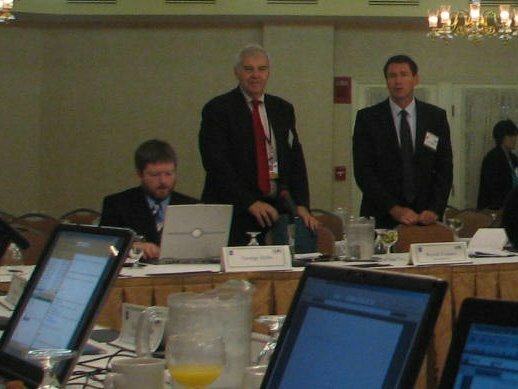 The agenda enabled presentations of the liasions including information on the forthcoming CODATA event in Beijing, the activities and achievements of the Chinese Remote Sensing Center (CCSDS), the eGeophysical Year, the EU's Information Society Program and Agency GEO activities including NOAA, NASA-USGEO, USGS EROS. A possible GSDI-WGISS joint contribution in GEO tasks implementation was welcomed by Osamu Ochiai, Senior Program Officer of the GEO Secretariat hosted by the WMO in Geneva too. 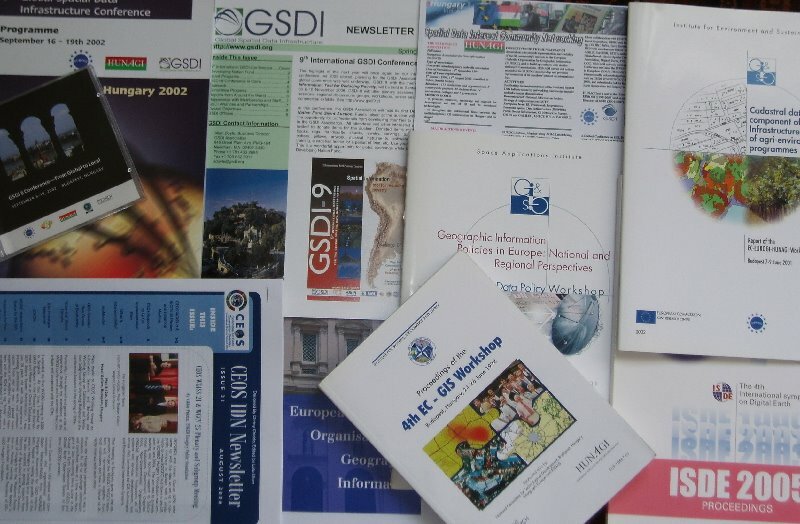 It should be mentioned, GSDI has multipath connnections to GEO: directly and through its member organisations on regional and country level. 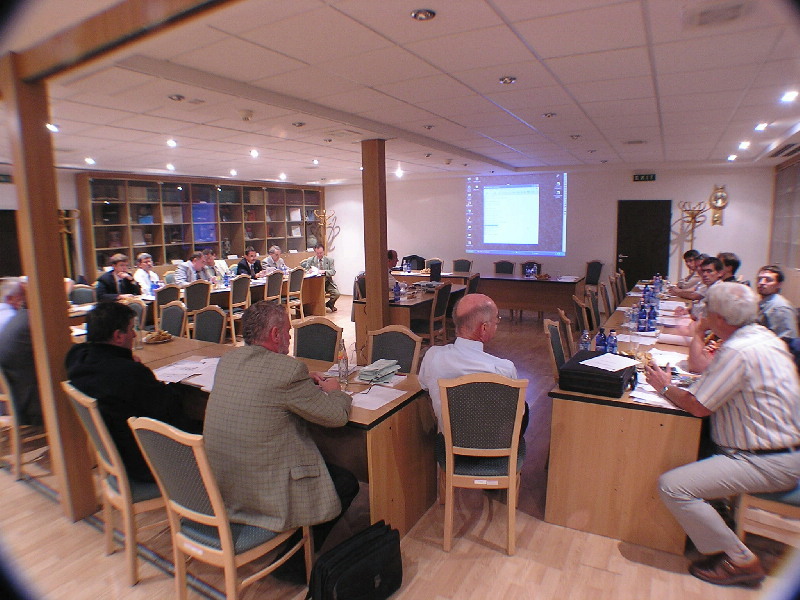 The UNSDI, GeoNetwork concepts and the forthcoming event in Budapest scheduled for 28th September was announced. The report of the meeting will be discussed on the next week by CEOS SIT in La Jolla. Lola Olsen (NASA) offered the possibility to HUNAGI to establish a Hungarian version of the selected parts of the NASA Global Change Master Directory. It will be the third foreign language version after Japanese and Thai. By request, a copy of the presented NASA GSFC video on the dramatic changes in the Earth's Cryosphere was offered via HUNAGI to the organisers of the coming Budapest event devoted to the Promotion of Sciences to be broadcoasted by two or more TV channels in October. Limited number of available copies of the brand new just published booklet of the Hungarian Space Research Office on the Hungarian Space Research 2004-2005 was disseminated for representatives of the meeting's host institutions. The chapter dedicated to Space Earth Sciences highligts the activities of leading institutions such as Space Research Group of the Budapest University of Technology and Economics, Geophysical and Geodetic Research Institute of the Hungarian Academy of Science, Eotvos Lorant University of Sciences, the Remote Sensing Center and the Satellite Geodetic Observatory of the Institute of Geodesy and Cartography as well as the Hungarian Meteorological Service. The Hungarian participant was representing the GSDI Association appointed as liasion by the Board of Directors to CEOS WGISS. Report on the meeting with emphasis on the SDI aspects will follow soon. 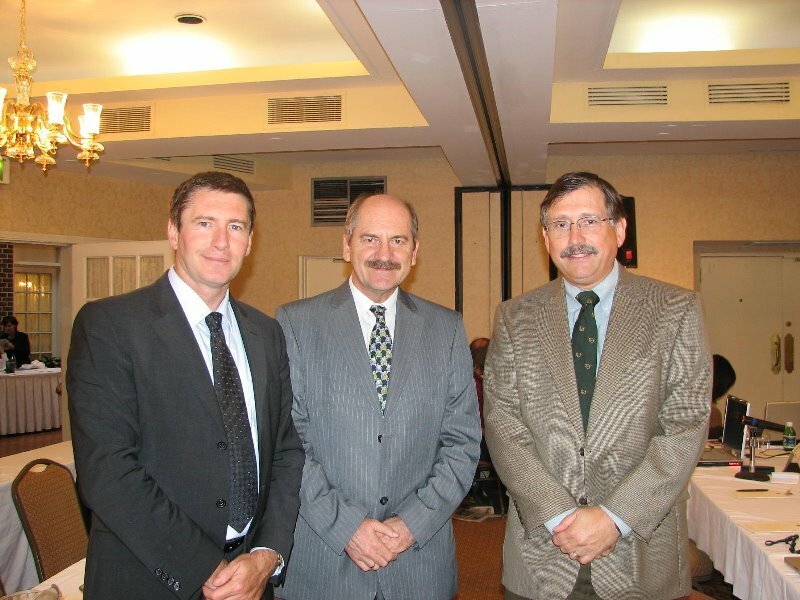 The City Mayor Hannes Fazekas and Business Manager Helmut Paugger invited the Hunarian Umbrella Organisation for Geo-information to attend the Opening on 12 September 2006 at the Concorde Technology Center in Schwechat. Welcome Talks will be moderated by E. Lindau Chefredakteur Computerwelt. Lecturers will include the City Mayor, representatives of the Ministry of Education, Science and Culture, the Austrian Chamber of Economy, the Austrian Research Organisation and the top officers of CEIT. HUNAGI will be represented at the ceremony by Dr.Szilárd Szabó, Editor-in-Chief of the Journal Térinformatika and his Editor Ms. Eszter Kiss. To ensure equal opportunity for the decision makers, communities and citizens, the availability and useability of spatial data have to be inproved. There is a need for comprehensive and multilevel awareness raising, capacity building and concentrated actions. Impacted areas include: education, research, sustainable management of renewable and no-renewable natural resources as well as communication and information. The common feature of these fields, the appropriate application of the mentioned technologies are beneficial for the economy, society and the preservation of the envirronment. combined with the advanced information and communication technologies (internet, mobil telephonia) has provides even more potentials by synergy. UNESCO should also mobilise its national nodes and domestic networks to facilitate the process e.g. by strengthen the acknowledgement of the integrated GI-related technmologies as enabling tool for the emerging information society. In this context Hungary paves the way for enabling geospatial data and related services FOR ALL on a non-discriminative basis with special emphasis on the INSPIRE initiative of the European Commission, a novel legislation framework anticipated to be introduced in Europe. Well represented in the intergovernmental coordination body of Information Society, the proposal of HUNAGI to introduce geospatial data availability as indicator for the strategic planning and implementation of information society was accepted in 2006. Additional proven services of the Institute of Geodesy, Cartography and Remote Sensing using operationally sat positioning, remote sensing and GIS technology include: crop monitoring and yield estimation, control by remote sensing for the area based agricultural subsidies, monitoring and mapping of natural disasters (erosion, flood, back-log waters, draught) or epidemy mitigation (allergic plant species). If approved by the government, these products and services will be upgraded in 4 topics in the operational framework related to the Information Society as follow: Digital Land Offices, Capacity building of the FÖMI Remote Sensing Center (established in 1980), introduction of the EUPOS satellite navigation services and implementation of the National Spatial Data Infrastructure program. 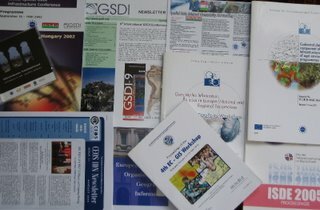 GI-related education and vocational training is provided using multilevel approach, by more than 15 Hungarian universities and colleges. As recent action, the Hungarian version of Lothar Beckel’s Space Atlas for School (an ESA publication) has to be mentioned, which was realised by the cooperative efforts of the Hungarian Space Research Office, GeoData Ltd and the Institute of Geodesy, Cartography and Remote Sensing. The book was released for geography teachers of primary and secondary schools first. A supplement with references to Hungary is also planned. Importance of PPP and Public-NGO partnership: HUNAGI, the non-profit interdisciplinary GI community network of more than 100 academic, governmental institutions and private organisations was actively participated the World Summit on Information Society. Other disciplines and sectors have also achivements in developing and use of geospatial data. Here – after the recent changes in the governmental sector - the Ministry of Environment and Waters, Ministry of Transportation and the agencies Meteorological Service, the public benefit company of Urban and Regional Planning as well as the National Geological Institute have to be mentioned. The involvement of the small and medium-sized enterprises is ensured mainly in the field of data production. SMEs are extremely active in facility management as solution providers in local environment of municipalities, but there is some small companies which enter the market with new, innovative (e.g. location-based) services. The national level coordination and partnership is a must in order to reach the goals and fulfill international commitments. HUNAGI Network provides an efficient forum for the dissemination of information, raising awareness and keep contact with the relevant European and Global associations such as EUROGI, EuroGeographics PCC, UNECE WPLA and FIG, ISPRS, ICA,GSDI Association, Digital Earth respectively. In close collaboration with the main stakeholders, a series of spatial data infrastructure-related Open Days are organised or prepared to facilitate the INSPIRE implementation and/or introducing GI-related service towards the UN institutions. In this latter case the formal establishment of UNSDI Hungarian Coordination Office (HUCO) by the major stakeholders is anticipated by end of September.